Pure PTFE Teflon® Packing – With Oil Lubricant : Pure Teflon Packing Manufacturer, PTFE Graphite Packing, Hollow Core Gland Packing, 100% GFO Gland Packing, Kevlar Cloth. 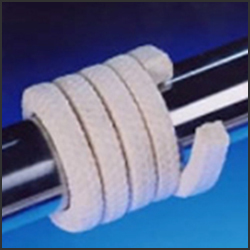 PTFE Braided by PTFE Teflon® fiber yarns and treated with a special inert lubricant. Under a minimum pressure of the stuffing box, it keeps unchanged in the long run. The low friction coefficient prevents the surface of the shaft from forming heat even in the presence of high peripheral speeds. Pure PTFE Braided Packing is suitable for high-Concentrated chemical products, strongly aggressive and oxidative Rubber core is also available.